flashzombies.com - "Little Red Riding Hood's Zombie BBQ"
Once upon a time... Your an anime little red riding hood with huge breasts fighting off hordes of zombies that come at you! 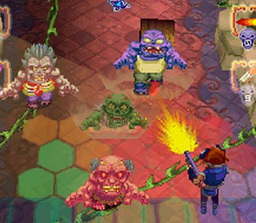 Its a zombie shooter, where tons of different zombies emerge and come after you while you try to shoot them. This game has it all, even little leaches that go underground to sneak up on you. In this game you can control one of two characters. Little Red Riding Hood or Momotaro (Who has a sweet chinese star move) I played the game with Red Riding Hood, and even got to kill the zombie grandma! This game takes a few storybook characters and adds a zombie twist. 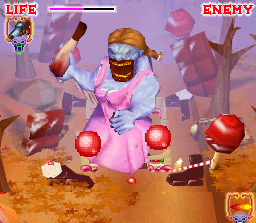 The Hansel and Gretel level is bizarre, but fun to play. Gretel holds what's left of her brother Hansel after she ate him. She's hungry for you, so watch out! Greatest thing about this game is the zombie variety and the many mini bosses. Worst thing is at times the game gets laggy, lots of 3d panning causes the game to slow down sometimes. But not too much, still can enjoy playing. If your looking for a fun game to pass time, try this. 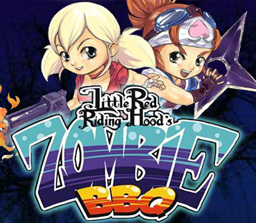 You get to kill zombies with flame throwers, machine guns, shotguns, ninja stars, lazers and more. Also beware of fat zombies, they explode. What else would they do!?! The controls sometimes are hard to come by. When you have ten or more zombies coming at you, the controls get confusing. You have to use the DS pen to touch where to shoot, sometimes your hand gets in the way of what's going on. 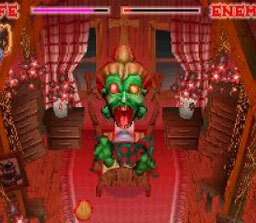 As for levels you get seven worlds, with two levels each and a final boss. The bosses are always fun! Overall, good game to have. For every zombie lover. What do you think of this game? 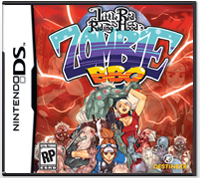 Click here to discuss Little Red Riding Hood's Zombie BBQ in our forum.